With a wingspan of 245-280 mm, the Barbastelle is considered a medium-sized bat. It is characterised by a short, blunt snout, a dense silky black fur as well as a dark face and membranes and small triangular ears. 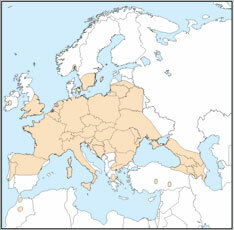 It is widely distributed across Europe but its range is heavily fragmented. B. barbastellus favours forested areas as it uses loose bark and tree cracks for summer roosts. During winter and in colder climates, the species prefers to roost in caves, rock crevices and mines. During hibernation, the Barbastelle can be found individually (in crevices) or in clusters. B. barbastellus has a very agile flight, which together with its unique alternated echolocation calls, enables it to hunt moths while in flight. It is largely a sedentary species; the distance between summer and winter roosts usually being under 40 km. Decreasing according to the IUCN Red List. The Barbastelle bat is largely restricted to central and southern Europe, although its range extends into the Caucasus, Anatolia, Morocco (North Africa) and the Canary Islands (La Gomera and Tenerife only). So far, it has not been observed in southern central Spain, or on Crete or Cyprus. Threats to the B. barbastellus include the loss of old mature woodland and ancient trees and the disturbance and loss of underground habitats.